I have used many to-do apps. This is the best for me so far. I have it on my iPhone & Mac. It syncs between them. I have used it for about 18 months now. Usually I dump a to-do app after a month or so. After using it for a year I tried another well regarded to-do app and used it for about 3 months. But then I dumped that one and came back to Clear. I love the interface & the swipes. I love that you can name and re-name your lists. With some apps you are stuck with their list names. I highly reccommend it. My wife has just started using it on her devices and is very happy with it. 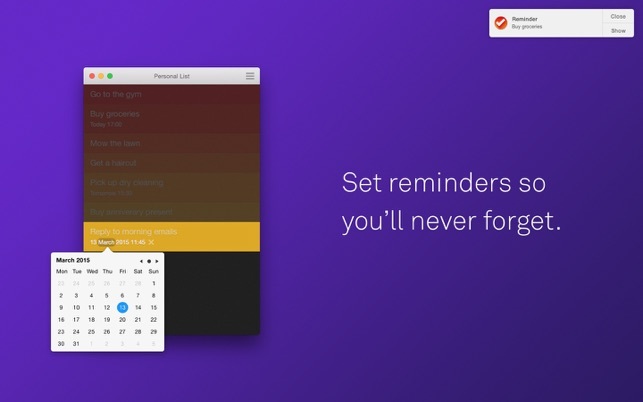 It also has reminders if you want but I have not used that feature. Improvements I hope to see a) on iOS the ability to move an item from one list to another easily without the laborious actions of select, select all, copy, escape, go to the new list, create a new item, and paste. On the Mac OS X you can just drag the item from one list to another (which is fantastic) but not on iOS. b) on the Mac, deleting a task is a bit hit or miss for me and so I usually just delete tasks on the iPhone which then syncs to the Mac. Overall for me this is a 5 star app and is one of my most used apps on a daily basis. Just pay the money. It is worth every penny. I’m constantly working from TDLs and I need an app that will work across all my devices. I didn’t want to spend a lot for bells and whistles my life doesnt require. I have found the perfect “combo-solution.” I use CLEAR for my CATEGORIZED TO DO action list. The things I need to do today, this week, or soon, in the order of their importance - which may change from day to day. I also use Apple Reminders for regularly recurring tasks and reminders. CLEAR is my Hot List It keeps the clutter out of my other reminders. My CLEAR lists are TODAY, GTT (my business), CRAFT, TECH, ESL, AT HOME, SUMMER PROJECTS and LONG TERM. 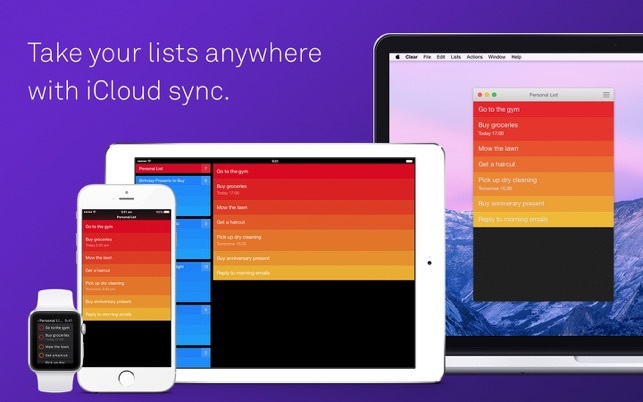 Within each of those I have lists, but by far the most useful part of CLEAR is my TODAY list. If you want a basic, very customizable, notify or don’t notify task manager, and you are not a high power exed, this app works beautifuuly across your Apple universe. I tried several others - some were more complex than my requirements, some were only iOS but not Mac, others were just far more than I was willing to pay. 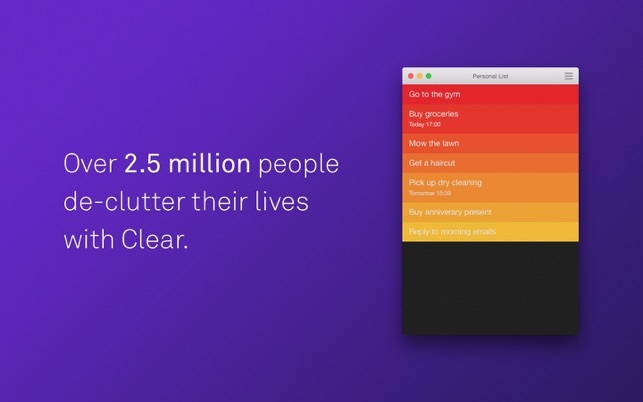 CLEAR is a simple productivity app that I would not want to live without. Because it works, I can work and get a lot of things off my TDL. Excellent for iPad, good for desktop and iPhone. An honest loving review. I absolutely love Clear for iPad and have been using it consistently for more than a year. 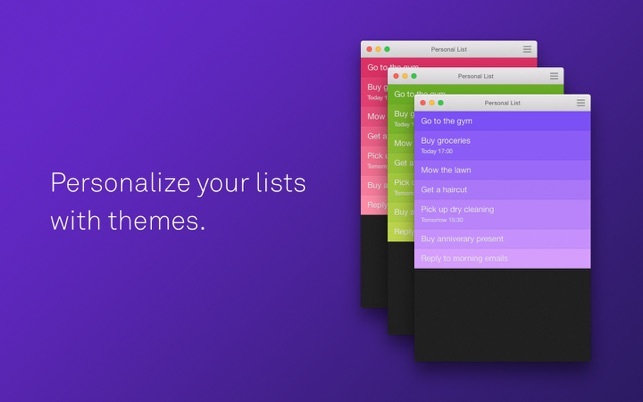 Its iPad version lets you create many lists, add multiple tasks to each list, move tasks between lists, set reminders, and rank both lists and tasks in order of importance as indicated via color gradation. Its visually intuitive and the predictive text is quite good too. 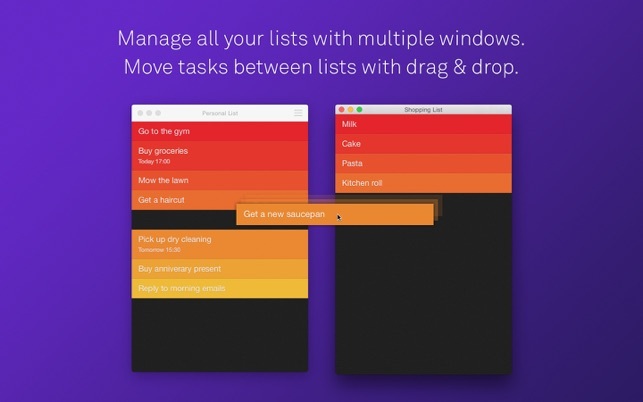 The ability to move tasks between lists is a feature only on the iPad, and is sorely lacking on both the desktop and iphone versions. I don’t mind it so much on the iPhone as I mainly use that to cross of tasks as I move about. Only on the iPad can I reorder and reprioritize my tasks with ease. If they fix the desktop version to be more like the iPad, this review will go up to five stars. I fixed my syncing issue by turning the Sync option off, letting it sit, turning it back on and then not using the program on any device for about 4 hours. If it makes you delete your lists before disengaging from the cloud, simply export your lists to email and them reimport when it is all fixed.